Samuli Mansikka || Ganesh 1, Tsum-Valley, Nepal. Oct 20th – Nov 23rd 2013. Ganesh 1, Tsum-Valley, Nepal. Oct 20th – Nov 23rd 2013. GANESH 1, NEPAL , 7420 m.
Altitude Junkies team attempted to find a new route from Nepal side of Ganesh 1 in late autumn 2012. Expedition was lead by Phil Crampton and assisted by Samuli Mansikka. Despite of scouting several options the team was not able to find a safe route to higher than 5700 meters on this 7420 meter tall mountain. The team came across with extremely dangerous amounts of rockfall and avalanches. Maybe some peaks just are not meant to be climbed. The expedition was however a very enjoyable experience in a very beautiful and remote setting. On kyllä aika lailla perhosia vatsassa näin Ganeshille lähdön kynnyksellä! Huomenna bussilla Arughatiin ja siitä sit ylihuomenna etiäpäin. Greetings from Arughat at the trailhead! What a terrible 9hr drive it was but how beautiful it is in this part of Nepal! Simply stunning! Lounas Lidingissa! Saa nahda mita tulee ja kuka dal bhatit laittaa? Tenavat pyorii jaloissa ja mummo tuhannen pollyissa! Olut on kylmaa! Ja onpa todella kaunista! Olisko sittenkin Annapurna Circuitia hienompaa? Ja sainpa muuten koko syyskauden parhaan dal bhatin Arughatissa! Tatopani ja yksinkertainen majapaikka! Yhteismajoitus isannan vieressa huoneessa, jossa ei savulta nae sangyn jalkopaasta toiseen paahan. Kind of a long day from Arughat to here. ’Impossible’, the locals said in Liding. Had good wash at the local hotwater springs here. Another long day from Tatopani to Lokpa at mouth of Tsum valley! Think I’ll try to reach basecamp tomorrow. What a wild part of Nepal it is! Ganesh basecamp ja aivan liian pitka paiva takana! Nousua 1900m:sta 4050m:iin ja km:ja 35. Ja karttahan oli aivan pielessa ja eksyilya oli. Technical problems at Ganesh BC. The valley is too deep to connect on bgan. Can’t do emails now! Will only update on Twitter. 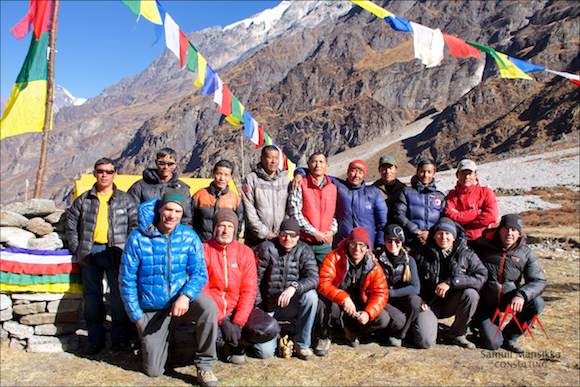 Phil, Awongcho, Kami, Chongba, Pasang Nima & Sange blasted up scouting the route up to 5000m and fixed it to most parts. what a jumpstart! Teknisia probleemia; laakso liian syva eika saada signaalia bgan:illa. Emailit ei kulje, eika saada kuvia. Twitter toimii satelliitilla ok! Lazy day at Ganesh BC. Did a lwalk up the valley to scout other possible ways up Ganesh 1. Good day however! Surrounded by good people. Lepailya beississa. Ryhma kavi ykkosessa (5000m) eilen. Oma paiva meni kuumeillessa ameebaa pois. Huomenna ylos ja reittia eteenpain. Tanaan etsittiin reittia suunnitellusta ykkosleirin paikasta ylos ja harjanteelle. Umpikuja ja liialliset kivivyoryt tuli vastaan 5500m:ssa. Huomenna kannetaan muutama kilometri koytta alas ja lahdetaan tutkimaan seuraavaa vaihtoehtoa laakson toisessa paassa. Kegarne! First defeat. Extremely difficult and dangerous climbing stopped us at 5500m on NW-ridge route. Now scaling other options. All difficult. Retrieved rop&gear from intended camp 1 on NW-ridge. Head of the valley dangerous due to serac-falls. Looking for new approach to NW-ridge. Found access to reach NW-ridge! Descended down to 3900m and climbed to 5500m! Got views to summit (7420m) but don’t know what’s in between? e don’t seem to find a safe way to get up this thing. Something about her being sacred and not letting anyone approach her summit..
Finishing the expedition! Ville, Mila, Robert&Jose choppered out this morning. Phil, Damien, staff and I are trekking out from 14th onwards. Left Ganesh basecamp and made it to Domje at 2500m. Thank goodness for warmth! 45 mules and 13 porters accompanying us on way to Arughat. Street-party at Phillim’s mad-crazy!! Also saw dozens of langurs on the way here! Trekked down to Machhakhola today. This truly is a magnificent part of Nepal! That’s it for this years trekking! Got back to Arughat and drive to Kathmandu tomorrow. Ain’t ’gonna walk s#%t until in Tanzania in Jan-Feb! Phil’s dispatches on our Ganesh 1 expedition are now all online!! Check them out and bookmark http://www.altitudejunkies.com! Back in Kathmandu. Madness it was getting here today! Traffic and roads are terrifying. Kicking back for a couple days before flying home. Incredibly clear skies in Kathmandu these days. 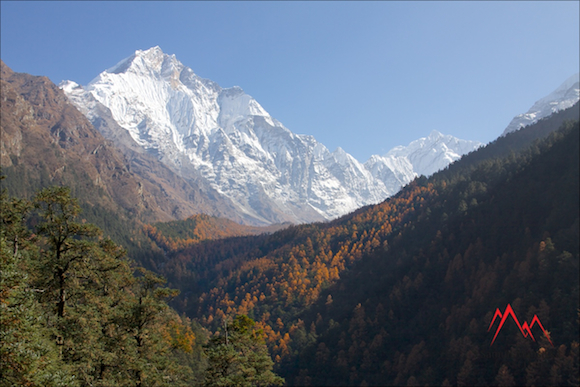 You don’t see snow-covered peaks of Langtang through your hotel window in Thamel too often!